Police have asked Tony Blair about notes of conversations between his chief fundraiser Lord Levy and a major Labour donor, the BBC has learned. Notes made by Sir Christopher Evans, who loaned the party £1m, have been seized by officers. They allegedly include references to honours. But a spokesman for Sir Christopher, a businessman, said there was no record of promises of peerages. 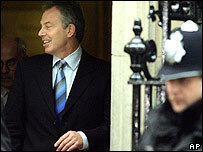 Mr Blair's questioning was not under caution, meaning he is not a suspect. It is believed to be the first time a sitting prime minister has been quizzed by police in connection with a criminal investigation. Lord Levy and Sir Christopher were both arrested earlier this year as part of the police inquiry into the cash-for-honours affair. Lord Levy has told friends that if people want to fantasise about what he might have said during conversations with Sir Christopher, that is up to them. Meanwhile, the Liberal Democrats have raised "serious doubts" about the "probity" of Mr Blair following his questioning. The interview happened on Thursday - the same day as the government revealed that the Serious Fraud Office had ended its investigation into British firm BAE's deal to sell planes to Saudi Arabia. Also on Thursday, the findings of an official UK police inquiry into the car crash which killed Princess Diana were announced. Mr Blair's spokesman emphasised that there had been no deliberate plan to "bury bad news". However, Lib Dem chief of staff Norman Lamb said: "To have the government conspire to close down an investigation into serious corruption allegations in the international arms trade on the same day as the prime minister is interviewed by the police over domestic corruption allegations shows how far from 'whiter than white' this government has moved. "This is the final nail in the coffin of this government's reputation." The cash-for-honours probe was sparked by revelations Labour was given secret loans ahead of last year's election. Some donors were subsequently nominated for honours. About 90 people have been interviewed by police during the honours probe. Three people have been arrested but no charges laid. All deny any wrongdoing.